That squid sidecut thing is a blast from the past, wasn't Velzy doing those in the 60s? Stu Kennedy's quiver of Tomo's for the US Open. I love he's riding stuff that looks like this in a 'real' surf contest, and I love he's do well so far. 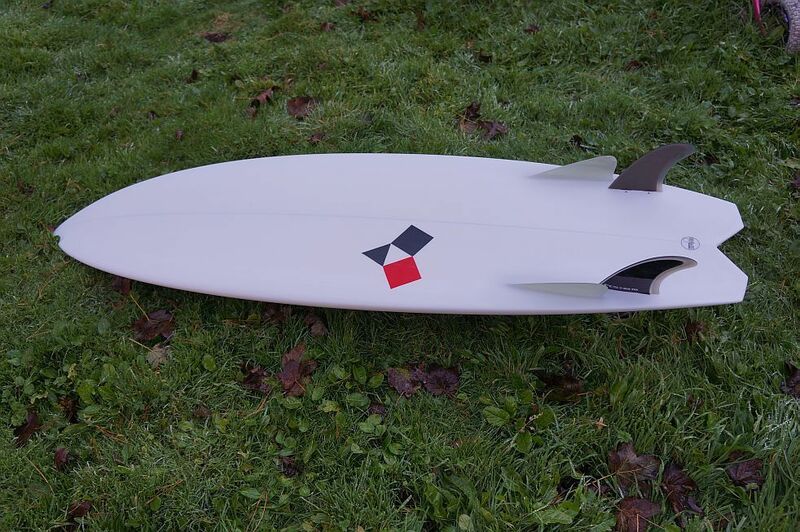 No longer oddballs - I saw firewire are going to be mass producing TOmo shapes now! Archy_is_God wrote: That squid sidecut thing is a blast from the past, wasn't Velzy doing those in the 60s? The first board i shaped from a snapped SUP its a mini Simmons but inspired by a bing speed square. Its goes well in clean waves and super fun down the line. Cannot WAIT to see how it goes. You know what...you're on to something there. I'm going to use that expression the next time someone asks me about my Lumus. Saving up for a smaller one of what Flacky's got above (Empire Spectro). Let us know how you get on with it fella. Last edited by flacky on Thu Nov 22, 2012 11:05 pm, edited 1 time in total. There's a marginally used one in Fluid Concept, I think it's the one off Empire's site. Red resin tint, 5'10, lokbox fins. He wanted 275, I reckon you'd get it posted for that. Looked mint. The Spectro "stock" is very different to mine. Flat through fins, No bonzer channels or fins, and has a wide square tail. Still an amazing looking board, I was just concerned by how flat it looked in the tail... Very wide, could imagine it spinning out. flacky wrote: There's a marginally used one in Fluid Concept, I think it's the one off Empire's site. Red resin tint, 5'10, lokbox fins. He wanted 275, I reckon you'd get it posted for that. Looked mint. The Spectro "stock" is very different to mine. 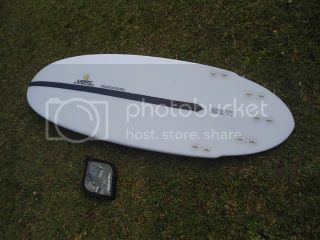 Flat through fins, No bonzer channels or fins, and has a wide square tail. Still an amazing looking board, I was just concerned by how flat it looked in the tail... Very wide, could imagine it spinning out. Yeah I checked that one out when you mentioned it in another thread, but it's the original version of the Spectro, which Steve has since re-designed, with the back end now being a slimmed-down version of the Lumus. Quite a different board really. Ahh, didn't know he was doing that... Thought this one was a one off personal jobbie... It looks a lot better. There's a lot of foam in it. Mine's pretty heavy and looks massive. Going to take it to Wales tomorrow I think, only small swell but should be fun on the beaches. Let you know how I get on. 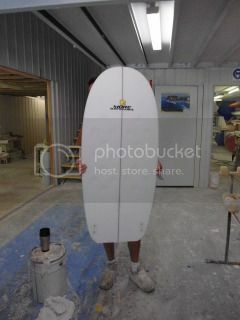 O'l Stevey makes some solid boards! Funny thing is today I was working on a personal twonzer for a trip to the islands, and our airbursh guy came in with a twin/trailer made by Taylor here in SC. But, his was kind of a souped up C5... radness! 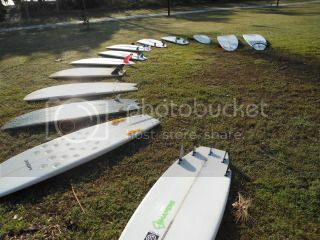 Wanted to take it out today, but after seeing the cams this morning took the 9'8 squire chip... Oh boy what a blast! rolled bottom, twitchy, thruster style pulled in nose, backhands have to be sensual! So much fun! 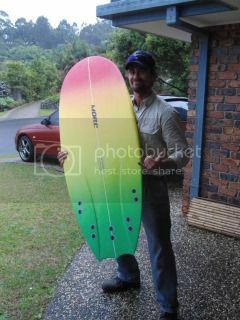 royal wrote: O'l Stevey makes some solid boards! 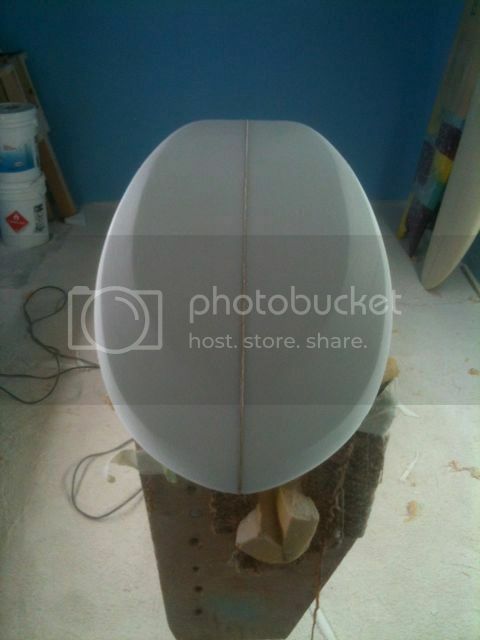 call it a little bit of Lisjobnough influence..
Not so weird , just a one-of.......yer basic daily twin fin.